The statuesque clock tower of old city hall sits in the background surrounded by the modern office buildings. The busy street scene shows people walking along the sidewalks of downtown Toronto. The old city hall's clock tower is a beautiful backdrop in the city of Toronto. Bright red banners hang from the tall poles along the street. Downtown Toronto street scene with the clock tower of the old city hall in the background, Toronto City, Ontario, Canada. 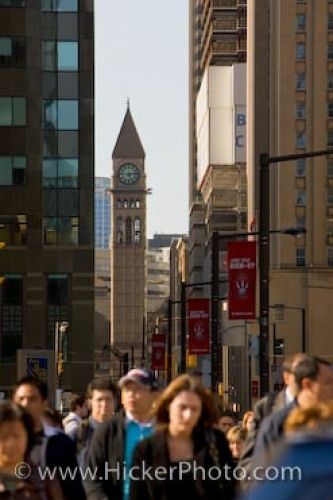 Street scene in downtown Toronto with the old city hall's clock tower in the background.